Still continuing to serve decent (if pricey) ales but like so many places in London it seems to miss out on proper bitters. There were plenty of pales and golden ales and a few stouts (the Barton macchiato stout was the one I tried) but no decent bitter on offer. After a hiatus of over 3 hours, I returned to the Express Tavern. This is part of an ever-expanding chain of well-run pubs with a good ale and cider selection. Sunday evening was no exception. Some of the blackboards were incorrect. But the ale selection was Bass, Harvey's Sussex Best Bitter, Big Smoke Solaris & Dark Wave, Errant Altura Coffee Stout, Hammerpot Harvest Ale, Oakham Citra, Steam Box Ghost Train, Watney's Ray Of Sunshine & Bingham's Rye IPA. Ciders were Sandford Orchards Devon Red, Orchard Pig Marmalade Cider & Navel Gazer, Lilley's Mango Cider & Gwynt y Ddraig Farmhouse Scrumpy. I prefer the Antelope and the Sussex Arms. 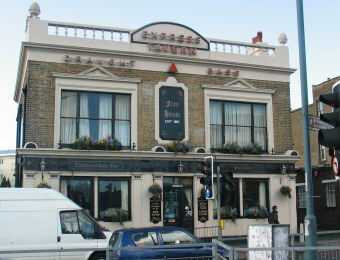 But this is still a very good London pub. We moved on from here to the nearby Stable for a few more ciders and a pizza. I will request that to be added. But it is just next to One Over The Ait. Sad to see the lawn at the back has been replaced by astroturf and seating, at least the fishpond is still there. Trying to cram too many dining tables into the small lounge. Having said that a good selection of beers and ciders, but had to be a traditionalist and had the Bass - which was reasonable. I have to disagree with some off the comments posted, after a promising I think this pub has gone backwards. The main problem is the ales (the first thing you should get right), they are served far too warm. This has been an issue here for some time - if there is an issue with the cellar temperature then maybe they could consider line chillers on their ales? This could be a great pub but they really need to address their key business - The Beer!